The only comprehensive, firsthand account of the fourteen hour firefight at the Battle of Keating by Medal of Honor recipient Clinton Romesha, for readers of Black Hawk Down by Mark Bowden and Lone Survivor by Marcus Luttrell. "'It doesn't get better.' To us, that phrase nailed one of the essential truths, maybe even the essential truth, about being stuck at an outpost whose strategic and tactical vulnerabilities were so glaringly obvious to every soldier who had ever set foot in that place that the name itself—Keating—had become a kind of backhanded joke." In 2009, Clinton Romesha of Red Platoon and the rest of the Black Knight Troop were preparing to shut down Command Outpost (COP) Keating, the most remote and inaccessible in a string of bases built by the U.S. military in Nuristan and Kunar in the hope of preventing Taliban insurgents from moving freely back and forth between Afghanistan and Pakistan. Three years after its construction, the army was finally ready to concede what the men on the ground had known immediately: it was simply too isolated and too dangerous to defend. On October 3, 2009, after years of constant smaller attacks, the Taliban finally decided to throw everything they had at Keating. The ensuing 14-hour battle—and eventual victory—cost 8 men their lives. 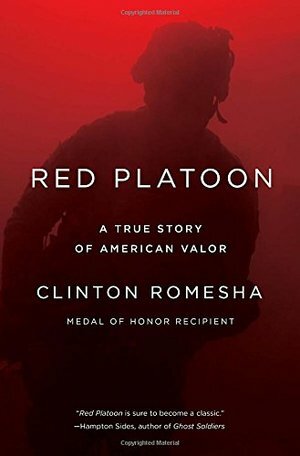 Red Platoon is the riveting first-hand account of the Battle of Keating, told by Romesha, who spearheaded both the defense of the outpost and the counter-attack that drove the Taliban back beyond the wire, and received the Medal of Honor for his actions.